All structural materials for reinforced concrete and the standard acceptance tests for such materials are prescribed under the ACI (American Concrete Institute) Code which is a leading authority for inspection, project management and consulting for individuals and organizations involved in construction and concrete design. The ACI revises its specifications time to time to facilitate improvements in production methods, materials, and testing. Beam and girder are the two frequently used codes in structural systems, specifically in the 1995 ACI Code. Both are subjected to flexural loads and act as primary part of the structural framing system. Both are horizontal members and among the most commonly designed elements of structure. Both the terms are often used interchangeably but certain factors distinguish one from the other. Understanding the difference between the two is crucial to construction scene. A beam is a primary part of a structural framing system specially designed to carry distributed loads such as parallel walls or roof systems. Beams are one of the most commonly designed elements of structure in engineering intended to resist loads and its primary mode of deflection is bending. It is mainly used for resisting bending moments, vertical loads, and shear forces. Thus, beams are defined by their bending moments which are calculated for the primary requirements for building a structure. In simple terms, any horizontal structural member which undergoes lateral load and is capable of withstanding load is a beam. Girder is basically a beam which supports other smaller beams and acts as the main horizontal support of a structure. Unlike beams, girders are designed to support major concentrated loads such as columns or beam reactions and their load bearing capacity is much greater than beams. It can be made from a variety of construction materials such as concrete, stainless steel, or a combination of both. It supports vertical loads and may consist of a single piece or more than one piece bound together. Beams are horizontal members and one of the most commonly designed elements of structure typically intended to carry distributed loads such as parallel walls or tributary areas of the floor and roof systems. It is a structural element capable of withstanding loads primarily by bending which are used for support in construction projects. A beam which supports other beams is commonly called a girder, however, it is still a beam. Girder supports smaller beams and act as the main horizontal support of a structure, designed to support major concentrated loads such as columns or beam reactions. The key difference between a beam and a girder is the size of the component. Beams are often referred to as girders in the construction scene and girders are the main horizontal support structure for smaller beams. So, we can say, all girders are beams, but not all beams are necessarily girders. Both are bending members distinguished primarily by the manner in which they are loaded. If it’s the main structural support consisting of smaller beams, it is a girder. However, there is no strict rules in the Code regarding dimensions that distinguish a beam from a girder. In engineering, beams are classified into several types based on many factors. Based on the type of support, beams are mainly classified into following types: Simply supported, Fixed, Continuous, Cantilever, and Trussed. Beams can be classified based on geometry as straight beam, curved beam, and tapered beam. 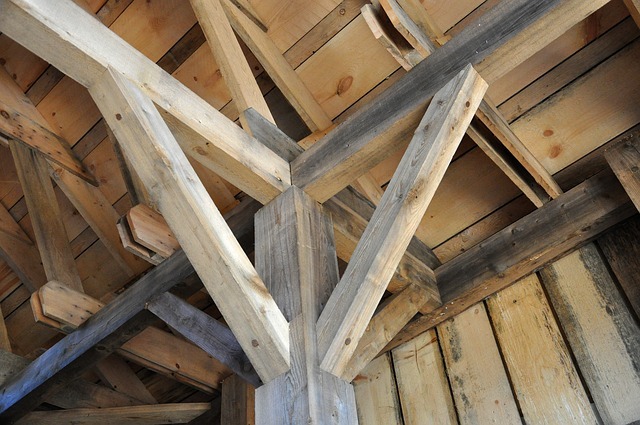 Based on the cross section shape, beams are divided into I-beam, T-beam, and C-beam. A girder is typically used to refer to a steel beam. I-beam girders are the most common type of girders used in bridge construction. Box girders are mainly used in construction of elevated bridges and roadway flyovers. Both beams and girders are horizontal members designed to support structures by the only deflecting factor, bending. Beams support the structural integrity of buildings, mostly residential structures and can be found in floors, walls, ceilings, roofs, and decks. Beams are the choice of structural member because of their incredible load bearing capacity against all conditions. 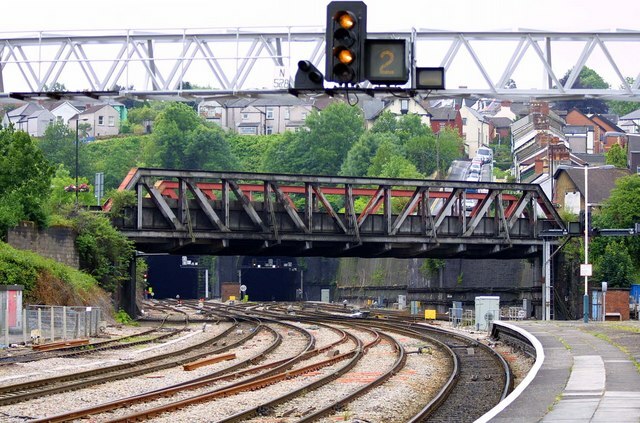 Girders mainly support smaller beams and are typically used to construct bridges and flyovers because they are capable of carrying extremely heavy loads. Girders are mostly used as box or Z shape members as girder bridges which are the most common and simple bridge type used in construction. Beams are horizontal members considered among the most commonly designed elements of structure whereas girders are also horizontal members that support smaller beams but act as the main support of a structure with dynamic load bearing capacity. However, beams are known by alternative names based on their location in a system and the material they use. For example, a basic floor joist is a beam which is lightly loaded and a roof joist, commonly goes by a “rafter”, is also a beam. A beam that supports other smaller beams is commonly called a girder, while it is still a beam, its load bearing capacity is much greater than a beam and is designed to support major portions of a structure. Thus, girders are mainly used for building bridges and flyovers, whereas beams are ideal for residential structures. In a nutshell, all girders are beams, but all beams are not necessarily girders. Sagar Khillar. 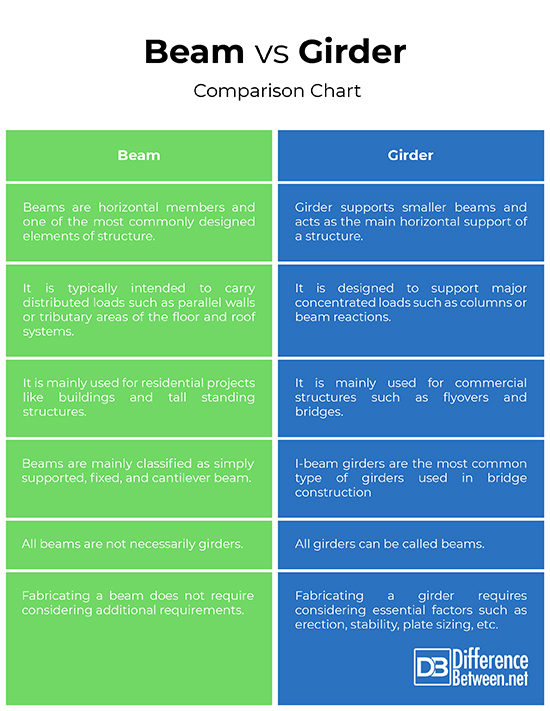 "Difference Between Beam and Girder." DifferenceBetween.net. September 20, 2018 < http://www.differencebetween.net/object/difference-between-beam-and-girder/ >.